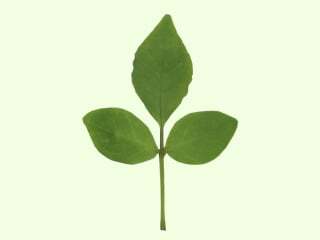 Home > Hinduism > Hindu Gods > Shiva > Why are trifoliate bel leaves offered to Lord Shiva ? 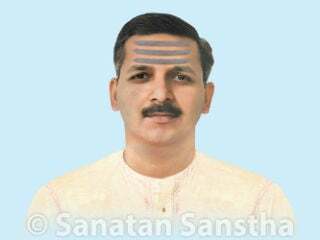 Why are trifoliate bel leaves offered to Lord Shiva ? While offering bel leaves, place them upside down, with the stalk towards the worshipper. 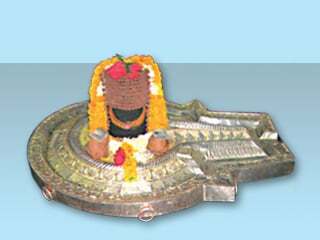 Meaning : I am offering to Shiva the bel which is trifoliate, like three components, like three eyes, three weapons and which destroy the sins of three births. – H.H. Parashram Pande Maharaj, Devad, Panvel, Maharashtra. components) state, and by performing saguṇ-bhakti, it becomes easier for a devotee to progress from the saguṇ to the nirguṇ. A. How to offer bel leaves according to the tarak and marak form of worship ? The bel leaves emit tarak waves; whereas, their stalk emits marak waves. 1. 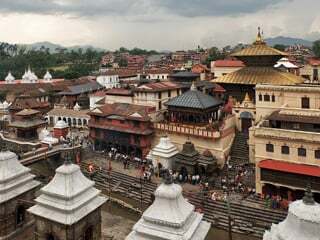 One who worships the tarak form : The basic nature of a worshipper corresponds to the tarak form and hence, worship of Shiva’s tarak form not only blends with their nature, but also helps in their spiritual progress. 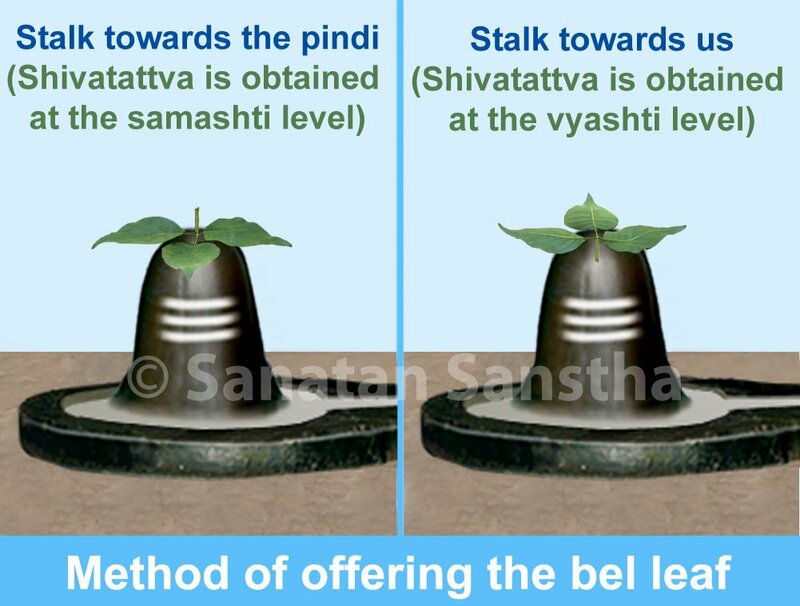 To benefit from the tarak waves of Shiva, worshippers should offer bel leaves with the stalk towards the pinḍi and the upper portion of the leaf towards themselves. (बिल्वंतुन्युब्जं स्वाभिमुख-अग्रंच ।). 2. 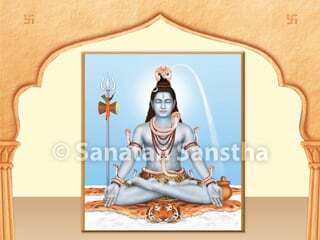 One who worships the marak form : The Shakta sect worships Shiva’s marak form. To benefit from the marak waves of Shiva, worshippers should offer bel leaves with its upper portion towards the pinḍi and the stalk owards themselves. A pinḍi contains two types of pavitraks (Subtle-most particles containing Chaitanya) from both – the Ahatnada (Sound produced through friction or by striking an object) and the Anahatnada (An experience of Akashtattva in the form of a continuous Divine sound, similar to the blowing of a conch, ringing of temple bells etc). To absorb the three pavitraks, that is, the two pavitraks from the pinḍi as well as those in the bel leaves, which are offered upon the pinḍi, trifoliate bel is offered to Shiva. Tender bel leaves can unite Ahatnada (Language of sound, that of humans) and Anahatnada (Language of light, that of Gods). The leaves should be offered with their stalk towards the worshipper and the leaf should be placed upside down on the pinḍi. The objective in this is to attract the combined energy of the trifoliate leaves towards the worshipper. 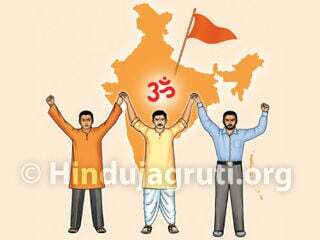 The combined energy of these three pavitraks facilitates the reduction of the trigunas. 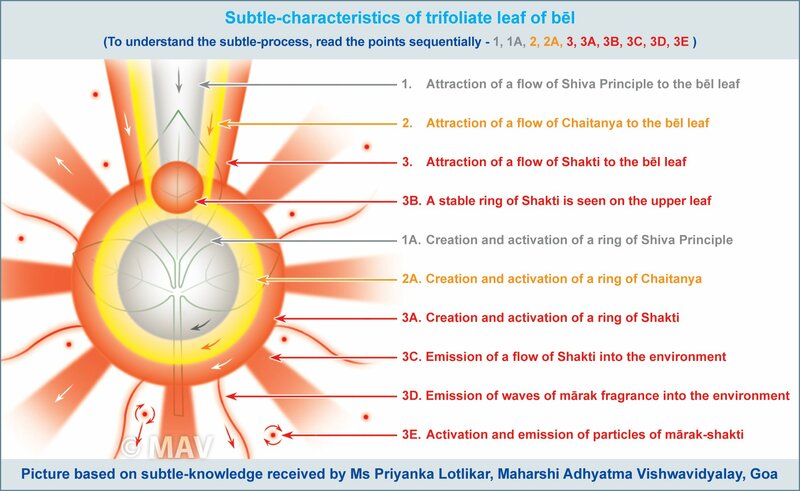 When we offer a bel leaf with its stalk towards the pinḍi and the tip towards us, the spread of Shivatattva through the tip of bel leaf is more. Due to this, the benefit of Shivatattva is obtained at the samashti level. Conversely, when the bel leaf is offered with its stalk towards us and the tip towards the pinḍi, the Shivatattva is obtained only by the individual who offers the leaf. In this way, the benefit of Shivatattva is obtained at the vyashṭi level. When the bel leaves are offered upside down on the Shivapinḍi, the vibrations at the nirguṇ level are transmitted in a greater proportion from them. The worshipper gets maximum benefit from the bel leaves. If fresh bel leaves are not available, old leaves can be used; however, the bel leaves plucked on a Monday cannot be used the next day. One complete bel leaf comprises three leaves. Hence, the entire leaf is known as ‘Tridal pan’ (Trifoliate leaf). When I looked at the trifoliate bel leaf, I saw the half-closed eyes of the meditating Shiva and in the upper leaf, I saw the third eye of Shiva. 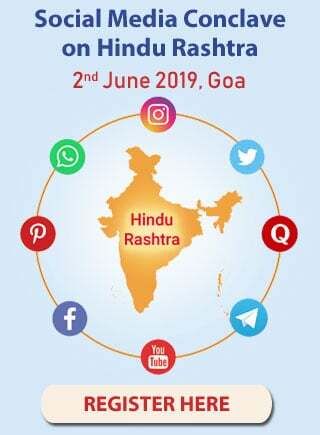 – Ms. Priyanka Lotlikar, Goa. ‘While looking at the bel leaves, I felt that they are a symbol of the triguṇas. Spiritual experience of Shivatattva : The bel leaves were emitting plenty of cool waves. The vibrations of Shanti were felt from them and the vibrations of Shakti were felt from its sides. Both the spiritual experiences were due to the Shivatattva in the bel leaves. Bel leaves helped in meditation : The vibrations of Chaitanya were being emitted from the stalk of bel leaves and I felt that they helped me go into a state of meditation (to concentrate my mind). Getting spiritual experience of Anahatnada : My mind was experiencing the Anahatnada and I could hear it in the subtle too.’ – Ms. Priyanka Lotlikar, Ramnathi, Goa. A. The Kayakalpa chapter in the Ayurveda discusses the importance of partaking juice of trifoliate leaves. B. Ayurveda refers to the fruit of the bel as the fruit of nectar. Fruit of bel is called a fruit of nectar in Ayurveda. There is no disease that cannot be cured with bel. If some medicine is not available, the bel should be used; however, a pregnant woman should not be given bel, as it may lead to death of the foetus. The three basic components of the human body - Sattva, Raja and Tama.